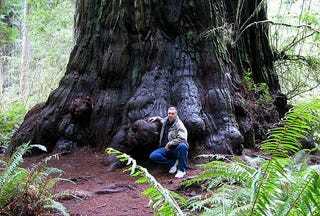 If you've never been, checking out a redwood forest is a fun weekend activity with the family. There's a certain humility experienced when viewing enormous objects (that's what she said). The redwood tree, also known as the sequoia, is less vulnerable to typical tree maladies such as disease or fire because of its bark and location. This explains why so many grow to insane dimensions. The largest is the Lost Monarch in California's Jededia Smith Redwoods State Park, which is approximately 26 feet in diameter and contains more than 40,000 sf of wood inside. It's one of the giant redwoods in the "Grove of Titans" and, we hear, a site to behold (if you can find it). The 2010 Shelby GT500 Super Snake is not quite so rare and, according to SirNotAppearing, not particularly special. 2010 Shelby GT500 Super Snake, More Serpents Unveiled! If I go "meh" in the middle of a forest of special edition Mustangs, and no one is around to hear it, do they still churn out more?